A new integrative medicine paper examines the role of gut bacteria on the maturation of the immune system and claims evidence supporting the use of butyrate as therapy for inflammatory bowel diseases like Crohn's disease, based on mouse models. Butyrate, a by-product of the digestion of dietary fiber by gut microbes, is believed to act as an epigenetic switch that boosts the immune system by inducing the production of regulatory T cells in the gut. Some studies have shown that patients suffering from inflammatory bowel disease lack butyrate-producing bacteria and have lower levels of butyrate in their gut. However, butyrate's anti-inflammatory properties were attributed to its role as main energy source for the cells lining the colon. This paper is the first to claim a molecular basis for the role of butyrate on the production of regulatory T lymphocytes. 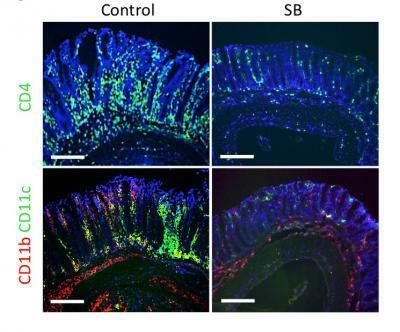 The team, led by Dr Hiroshi Ohno from RIKEN in collaboration with the University of Tokyo and Keio University, investigated the molecular mechanisms by which commensal microbes augment the number of regulatory T cells (Treg cells) present in the colon of mice that were bred germ-free. They found that butyric acid, a short-chain fatty acid produced by commensal bacteria acts on naïve T cells to promote their differentiation into Treg cells. It achieved this through epigenetic changes that regulate the expression of the genes responsible for differentiation of naïve T cells into Treg cells. Mice suffering from colitis saw their levels of Treg cells increase and their symptoms improve after administration of butyrate as part of their diet. "Regulatory T cells are important for the containment of excessive inflammatory responses as well as autoimmune disorders. Therefore these findings could be applicable for the prevention and treatment of inflammatory bowel disease (IBD), allergy and autoimmune disease," said Dr Hiroshi Ohno. "Butyrate is natural and safe as a therapy and in addition to that it is cheap, which could reduce costs for both patients and society."